Since moving back home to Kansas three weeks ago, we have been loving to build a fire in the fire pit and sit outside in the evenings. You can actually see the stars, and lately the lightning bugs have been out! I love it; I was definitely not made for big city life. The other day as we were getting stuff to make s'mores, we walked past the refrigerated cookie dough. My husband asked, "Hey, how do you think it would work if we wrapped a marshmallow in cookie dough and then roasted it?" Bless that man. His brilliant ideas like Bratwurst Pizza, Beer Cheesecake, and German Chocolate Tres Leches have been the inspiration for some delicious recipes! Needless to say, we bought the cookie dough and gave it a try. Break off a couple squares of cookie dough and smash them flat. Put a marshmallow in the center. Smoosh the cookie dough around the marshmallow. Make sure it's all covered! Place the cookiemallow on your skewer. And roast it over the fire! I will warn you it has a tendency to get melty pretty quick. Rotate it to help it cook evenly. 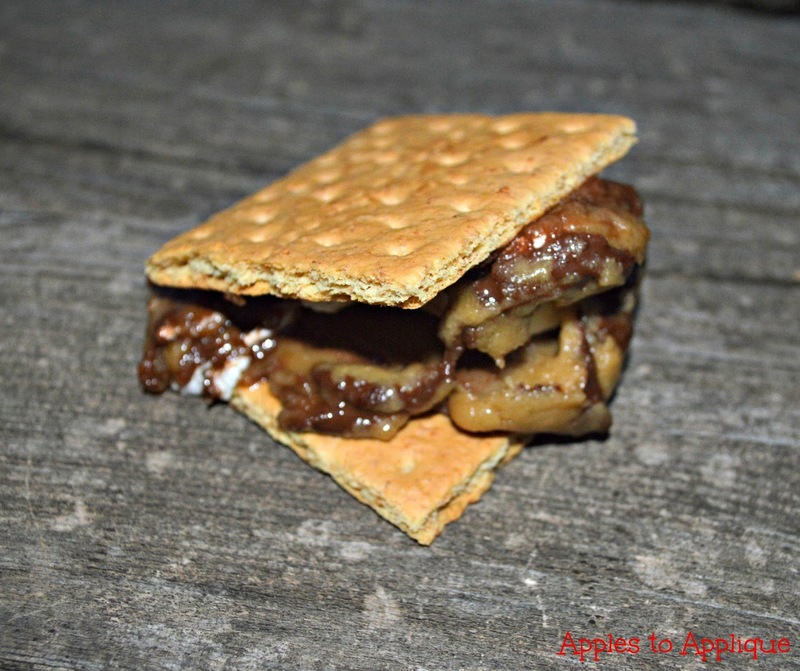 Slide the cookiemallow off the skewer and onto a graham cracker with a piece of chocolate. Now, how tasty does that look? Mmm! Gooey, melty, chocolatey deliciousness. Enjoy! What kinds of twists on the classic s'more have you tried? You're on to something here, I am SO trying this! It will be a huge hit with my daughter's friends. Genius idea! Oh my, I would have never in a million years, come up with this idea. It's certainly is fun. I love eating different food when I am out camping. It adds to the fun! I agree! There's just something about cooking food outside that makes it taste better, and when it's something new and fun like this, it's a double win! OH MY GOSH! Your husband is brilliant. These looks so amazing! 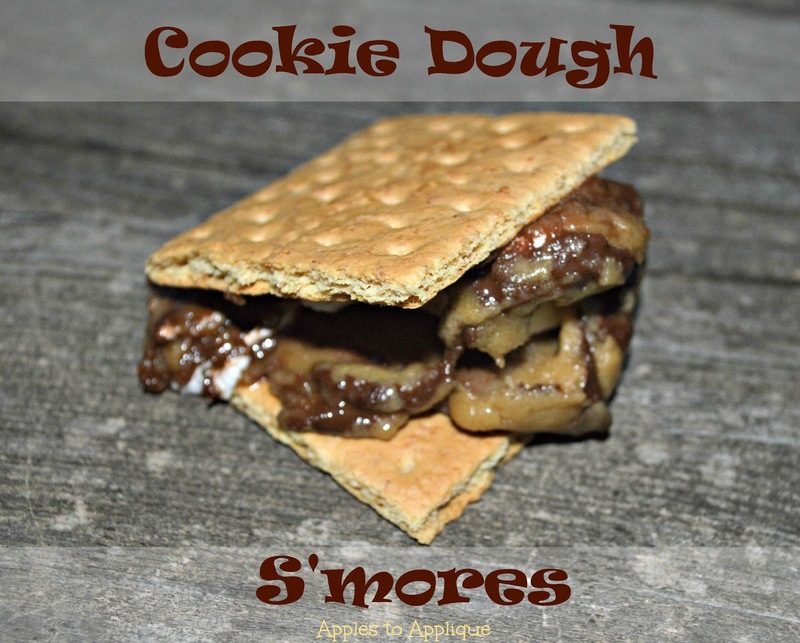 I think I need to have a fire in the fire pit this weekend just so we can make Cookie Dough Smores! YUM! Haha, I know! He comes up with the best ideas. I hope you like them! Oh my, these look heavenly. As a girl scout leader, smores are a big hit in our house. I bet you go through your fair share of s'mores with the girl scouts! Oh that is a dangerous idea.. my kids love both of those and to combine them... wow..
Now this is a completely new take on the S'mores! I never would have thought... I could eat one..but that's it.. seems rich but I am def going to try it ! They are rich! We each only ate one and then baked the rest of the cookie dough for later. That is freaking genius! I will be trying this the next time we have a bonfire! I wish I could take credit for being the genius. ;) My husband's food ideas certainly help this blogging wife. I hope you enjoy them!